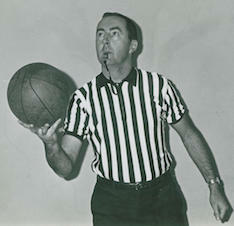 Jim Desmond was known for his prowess as a baseball pitcher at Toledo Central Catholic High School, the University of Toledo and in the Army in the 1950s, but basketball officiating became his focus in 1962. He worked 70-75 games every season for 20 years. He officiated at prep games in northwest Ohio for 17 years and was selected to work the Ohio Class AAA finals five times. Jim Desmond began working Division I and Division III college basketball in 1966, concentrating on the Mid-American Conference and home games of independent schools assigned by the MAC office. He spent 11 years as supervisor of MAC officials, retiring in 1996 only to return to the job temporarily in 2005 at the commissioner’s request.